Ahead of the first trailer, set to be released at Comic-Con, WB has released a new poster for the DCEU film, Aquaman. Initial buzz on the film has been very popular, and there is a lot riding on the movie’s success. If it can follow suit with Wonder Woman in winning back some of the hearts and minds Justice League and BvS lost, it could signal a rebirth for the DCEU. However, if it ends up getting snubbed like JL, we could be looking at a major overhaul of the entire film universe. 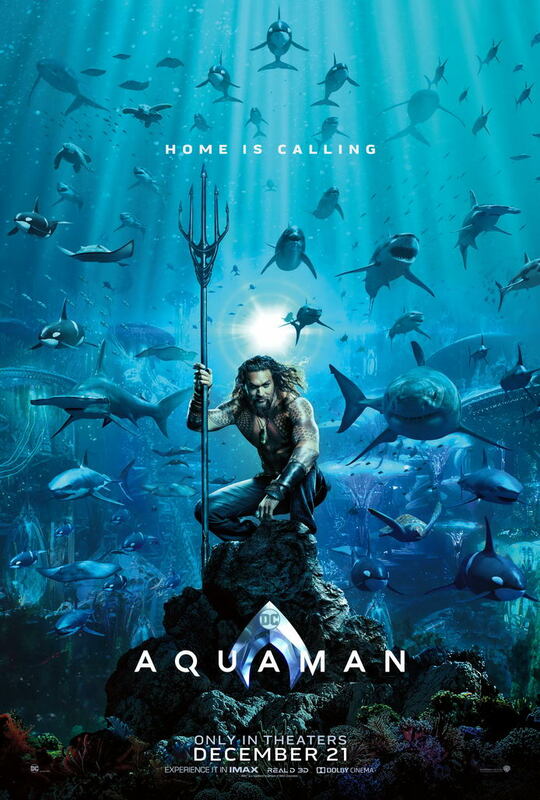 The new poster features Jason Mamoa in the front yard of Atlantis. He’s surrounded by more sea creatures than The Little Mermaid in the middle of a musical number. There’s really nothing else to say at this point, other than we can’t wait to see the trailer and we’ll have it for you as soon as WB releases it in Hall H! Along with Mamoa, Aquaman also stars Amber Heard, Patrick Wilson, Nicole Kidman, Willem Dafoe, and Yahya Abdul-Mateen II. The film hits theaters on December 21st.